Nous sommes désolés, mais l'espace Loft with industrial flair close to Moritzplatz (seminar room) - betahaus Berlin Kreuzberg n'est plus disponible. 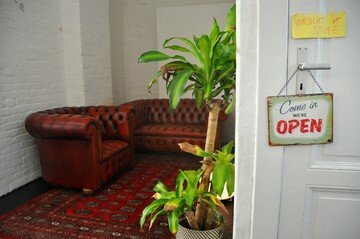 Affordable event space for your workshop / seminar / accelerator / function, etc. This meeting venue in Berlin is based on a concept of meeting spaces and has in addition to Berlin three more offices in Hamburg, Barcelona and Sofia. 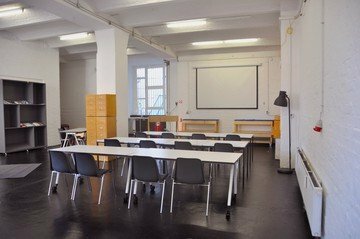 In addition to training spaces the Beta house in Berlin also features event and workshop rooms that can be rented for various occasions. By public transportation you get via the underground station Moritzplatz with the U8 to Beta house, which is based in Berlin-Kreuzberg. This meeting room is located on the ground floor of the building with direct access to the backyard. 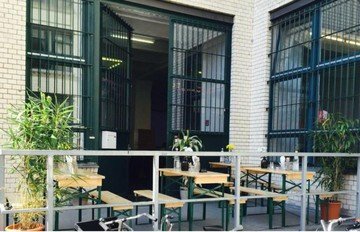 The Berlin-typical industrial charm offers metropolitan flair for your event. The room can accommodate up to 50 people. The spacious loft is ideal for workshops, training or a conference room. You can rent the loft for larger meetings as well. At Spacebase we’re regulars here. Situated around the corner from our office in one of the most vibrant area in the city, this multi-functional building offers space for so many diverse event concepts. I like the versatility of this room, it has the start-up vibe perfect for strategy meetings and off-site barnstorming. A breeding ground for raw entrepreneurialism, you can really get the creative bug in this versatile space.